The NASCAR Xfinity Series is at Pocono Raceway this weekend for Saturday’s Pocono Green 250 Recycled by J.P. Mascaro & Sons. Series regular Ryan Sieg welcomes KMB Plumbing, Electrical & HVAC on board as the No. 39 Chevrolet Camaro’s primary sponsor. Sieg and his No. 39 RSS Racing team are coming off a great race at Charlotte Motor Speedway last weekend finishing in the 13th position after starting 21st. 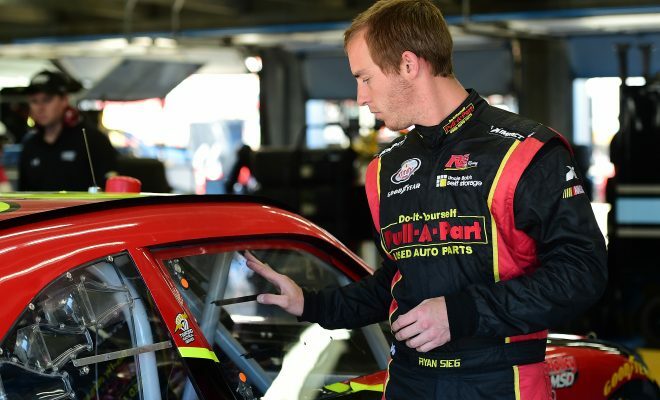 Sieg earned his best finish at Charlotte since a 10th place result in October of 2016. With momentum on his side and sitting 15th in the points standings Sieg will look to have a solid finish at the track known as The Tricky Triangle. Sieg has been very consistent this season and in his last seven races, his worse finish is a 21st place result at Richmond Raceway. He’s coming off finishes of 6th (Talladega), 17th (Dover) and 13th (Charlotte). In two NXS starts at Pocono, Sieg has an average start of 17.00 to go along with an average finish of 26.00. However, with momentum on his side and how he’s run this season, these statistics, especially his finishing average should change for the better. Note: The NXS cars will be running a new package in Saturday’s event. The series will use the same aero package that was successful at Indianapolis Motor Speedway last year. The race cars will have a bigger splitter and spoiler, aero ducts and restrictor plates. The package used at IMS set records for green flag passes for the lead with 29 and 16 lead changes. It’s expected that the package will make for closer racing, more passing and of course, exciting racing. The Pocono Green 250 Recycled by J.P. Mascaro & Sons is set for Saturday June 2 at 1:00pm EST live on FS1.